Note: The bergapten has been removed from our Bergamot essential oil that is the constituent known for causing phototoxicity. Bergamot is grown almost exclusively in Italy. It is a citrus fruit similar to orange, but it is not edible. Bergamot emits a delightfully fruity and floral scent. Bergamot is a central ingredient in many perfumes and colognes and also gives Earl Grey tea its unique taste. As a traditional Italian remedy, the oil was used to combat fever and infection. Bergamot essential oil is considered an effective antidepressant due to its primary ingredients, Alpha-Pinene and Limonene, both of which inherently have bright in aromas, and actively induce hormones. Bergamot is said to help create feelings of joy and happiness by improving blood circulation. Bergamot is considered a beauty oil due to its cicatrizant properties, helping to fade scars and acne from prominence. It is also considered antiviral and assists with mouth ulcers and herpes. Because of its heavenly scent and antibacterial properties bergamot is a popular natural deodorant. Studies have demonstrated Bergamot essential having the ability to balance the hypothalamus. Bergamot essential oil is wonderful to incorporate in cosmetic applications, personal care formulations, soaps, aromatherapy, and perfumery. You won't find a higher quality 100% pure Bergamot Essential Oil anywhere. "BEO [Bergamot Essential Oil] is also used by the pharmaceutical industry, both to absorb the unpleasant smells of medicinal products and for its antiseptic and antibacterial properties." "For its antiseptic and antibacterial proprieties, BEO has been used as an antimicrobial agent to facilitate wound healing and has been included in preparations used to treat upper respiratory-tract disorders and hyperhidrosis." "Bergamot essential oil is widely employed in aromatherapy, and has recently received renewed popularity in improving mood and mild symptoms of stress-induced disorders and facilitating sleep induction." "Aromatherapy massage [with Bergamot essential oil] has been shown to relieve symptoms of anxiety in patients with cancer." "It has been reported that BEO has both antibacterial and antifungal activity against Campylobacter jejuni, Escherichia coli O157, Listeria monocytogenes, Bacillus cereus, andStaphylococcus aureus and dermatophytes, respectively." "Several biological activities of BEO were shown, such as antimicrobial, anti-inflammatory, antiproliferative, and analgesic effects, including effects on the central nervous and cardiovascular systems." "Bergamot essential oil (BEO) is commonly used against psychological stress and anxiety in aromatherapy." "These results demonstrate that BEO inhaled together with water vapor exerts psychological and physiological effects in a relatively short time." I have always suffered from bouts of depression and anxiety. This has become my go to for those times. it helps to uplift my mood and when anxiety hits, it helps me get calm.. Thank You JB for such amazing oils!! I love this gentle citrus to blend with lavender for bedtime! I use this oil in my diffuser, as a relaxing oil. I personally love the smell. It just makes me feel good! I had never smelled pure Bergamot before this and really enjoy using this oil in my diffuser blends. Love this in my Nebulizer's and lotions. Very rich aroma. Love the Smell I use this in my pain rollers and for calming! This is one of my favorite aromas! My daughter and I both suffer from anxiety and this has been one of our go to. Made a roller bottle for on the go. It is now a staple in my bag. This is a must have oil. It is my go to for anxiety. It smells amazing! Love the bergamot! Smells great. Love to use for my anxiety and love that it's not phototoxic. Bergamot is a great oil to promote relaxation. Smells divine! I ordered this because my daughter loves bergamot and earl grey tea. It is very uplifting and a nice aroma. Another fantastic jade bloom oil. I followed the directions for mixing Bergamot and Clary Sage in water to gargle. My throat was so sore I could hardly swallow. I gargled 3 times the first day and thought - "this is doing nothing". The next morning I gargled before leaving for work. Sometime in the afternoon I stopped short and realized my throat wasn’t hurting. I was shocked and impressed. Later in the afternoon it was a little bit sore so I gargled again when I got home. This will be my “go to” in the future. Love Jade Bloom oils ! Bergamont is one of my favorite scents and this one is perfection. Makes a wonderfully uplifting, destressing earl gray bath bomb! I like to put this in my diffuser by itself. It has a fresh citrus scent that is always good for relieving stress and anxiety! Another versatile oil and theirs has such a great aroma. Love it. 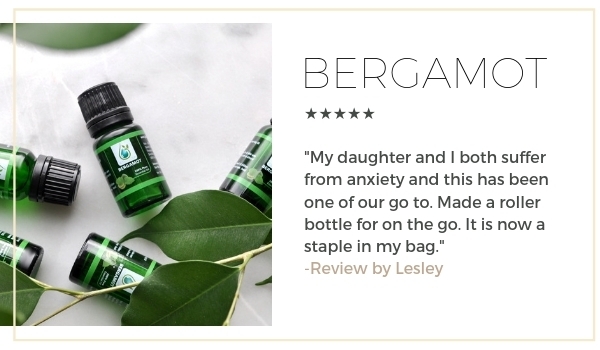 Bergamot is one of my favorite oils and I love the fact that Jade Bloom has taken out the bergapten which helps keep this oil from being photosensitizing. It's such a wonderful, uplifting oil that has a plethora of uses. A must have in any essential oil kit. Just ordered this after using the Smoothe blend - it helps keep my skin clear and since I already have the other oils in the blend I purchased this to start making my own. I love this, it's one of the best citrus oils. It smells like a citrusy Earl Grey tea (for obvious reasons). This oil is so uplifting! I love it! Love how uplifting the smell of this oil is.. Added bonus that I don't have to worry about the phototoxicity! I'm really enjoying all the different ways that you can use this oil. I originally purchased it to help with mouth sores which it is greatly improving the swords that I do get in my mouth. This is my favorite of all of my essential oils. This oil is so versatile. The best deodorate around. I LOVE IT! This is my favorite oil for the office. My coworker and I diffuse it in our space daily and get so many compliments from those who come in. It smells like Earl Grey tea (or vice versa) so that's probably why I love it so much. This is one of my favorite oils. Before using JadeBloom, I had never heard of Bergamot. I add just a little to my allergy blend inhaler. I love to use this in the summer and spring. It’s a great scent. I love the fresh, uplifting scent of Bergamot. It gives me a unique balance of energy and relaxation, making it easier to enjoy work while lowering my stress level. This is a great oil to use for ground and uplifting blends! I really like the light sweet smell BUT I can't say it did anything for the depressive episodes I use to have. I have found other essential oils that worked better for me. Different for everyone though. This is one of mine and my wife’s favorite! Love to diffuse! Calming and love the scent! Bergamot has a delightful orange scent. It is refreshing and also calming. Great to diffuse with other calming essential oils for sleeping. Love this Bergamot the smell is so light and refreshing. It mixes great with many oils for diffusing. If you don’t have this in your collection yet, get it you won’t be sorry! I promise you, you Will use it A lot!!!!! I absolutely love bergamot! One of my all time favorite oils! This oil is so uplifting and fragrant! I love this oil. I mix this with some ylang ylang in my diffuser necklace as a daily pick me up! I love how well it blends with other oils. I diffuse this together with ylang ylang! It helps my mood and is hopefully helping with hormones. I bought this oil as part of the high blood pressure kit, and I am very pleased with it! The aroma is very pleasant and blends well with the other two oils I got in the kit! Use it in my homemade soap along with lavender. Great for calming and relaxing. This oil is amazing. It has helped me so much with my sleep and relaxation. The only thing I dislike is the bottle because it pours out instead of drips out. I go through it quickly. This was nice, but not my favorite smelling. I heard it was a good respiratory oil though, so I use it at night in my diffuser. This is a great oil to have. I recently put together several "starter kits" of my own to give as christmas gifts. While asking my other oil friends what would be in there "must haves" bergamot came up on every single list. So many uses for it! I can see why some people may not love the scent, but I am obsessed with it! It smells like sour citrus, but it's not overwhelming. Makes me feel calm and grounded. Love the smell and it mixes well with so many other oils. It is a very relaxing oil. Honestly, until Jade Bloom and JB University, I had no clue what a Burgamot was LOL. Now I know, and I love it! It has a lovely fresh scent and is great for many uses! Love bergamont! Wonderful strength, great scent, useful in a variety of recipes. This was my first time trying Bergamot. I absolutely love the scent!! Love it,great price,smells great,shipped quick. I add this to my shampoo and conditioner. Love the smell... so does my husband so I just added it to his shampoo and conditioner. Also, use it in my homemade laundry soap and add to vinegar as a fabric softener! What a sweet treat in blends! Have always loved Bergamot, and this oil is wonderful. Will reorder. Bergamot is a strong scent that I enjoy using for relaxation and in many blends. I am so happy with bergamot essential oil, beside that it is free of phototoxicity it is strong aroma it is so relaxing , it is helping me with my insomnia. I like it helps with my scared however it is really strong. I like this one. It helps to calm the kids too. This has turned out to be my favorite of the fruity smells. It's aroma is uplifting, but yet has an unexpected depth of smell. You have to try it! Great for stress away blends! I love using this in my homemade deoderants! I've always liked Earl Grey tea, and we've been adding a drop or two of this lovely oil to our tea at my house to make it extra strong and delicious. I might try using some on my face, as I just read that it can also be good for skin. I've always loved the smell of Bergamot, and combining it with the Geranium has been such a delight! Thank you! Love this oil! Smells so fresh! My grandson recently had some boils pop up. We applied bergamont to boil and within a couple of days they were gone. Amazing how quickly the inflammation was gone. This is a basic oil that everyone needs. It is calming for the mind, and works well with children too. Smells very nice too. I plan to never be workout this oil. It is good for so many things. I love it's calming effect. It's also good on your skin. Sweet, fresh, versatile complex and wonderful! One of my go to oils for adding a citrusy note to blends! Bergamot is energizing. I diffuse some on Mondays to keep the Monday blahs from setting in. This oil smells so great. I love how positive and uplifting it is. It blends so well with other oils because of how light it is. Definitely not your typical citrus oil. Beramont is calming and smells lovely. I dufuse it with Cassa, Ylag Ylan and Ho Wood, smells wonderful and calming. This is so relaxing. I love to diffuse this at night with some lavender. It calms my mind and prepares me for sleep. Totally in love with Bergamot. I want to bathe in it. So energizing and clean smelling. The soft citrus scent blends well with many other oils. Love using it for skin solutions and bug spray. Fave! Great as an anti inflammatory!! Amazingly effective at reducing stress in our house!! I usually use a couple drops of this in the diffuser right before husband and kids get home along with other oils that call to me on any particular day. Works WONDERS! I love to put a couple drops in the bath with lavender and peppermint! i love the bright citrusy scent. it really gives me a lift when i inhale its fragrance. it is really great if you are feeling down. First time using this oil. Very light scent. Love it. This is the first time using this oil to make a Beard Oil for my husband. We both love it's light scent, but especially the softness and manageability of it now. I use Bergamot almost every day for allergies!! I bought this oil as part of an attempt to recreate my husband's favorite shave oil blend that has been discontinued from another company (hint hint, Jade Bloom: if you come up with a shave oil, we'll be among your first customers). I just read the list of ingredients and this was one of them. I haven't quite recreated the blend yet, but I'm glad I have this one in my collection because it works so well on its own and blends nicely with so many other oils! I love diffusing this alone or with other oils. Another great Jade Bloom oil. Wonderful citrus fragrance. Great diffused. Might be my new favorite! This bergamont seemed to be lacking the umph pleasant scent that bergamont usually delivers. It is one of my favorite citrus scents. Not this one. But it also has the benefit? of lacking the alleged ingredient that causes sun sensitivity that most citrus oils are guilty of. Maybe that is what causes the loss scent-wise. If using the oil for its chemical constituents vs it scent capabilities, you should be fine with the oil. It might be a trafe off. I love the scent in my diffuser all day. I also added to vinegar as a fabric softener. Even Spray on Linens mixed with purified water. I love diffusing this alone or with other oils. Very delicate scent and uplifting and clean. I recommend to anyone. Totally in love with all the products I have tried so far! I love this oil has a nice fresh smell! I love it and will definitely order again! I love all of Jade Bloom oils this is the best company out with great prices. I recommend to everyone. am always recommending them to every even the nurse at my doctor's office. I think I may have every oil but it's well worth the investment. I give Jade oils 5 plus stars , because they are the best. I ordered this essential oil because I read it was helpful as a mood enhancer. Since my mom passed away suddenly earlier in the year, I've been dealing with deep grief. The holidays are the worst...our first without her! I was struggling just to keep up with my normally busy lifestyle. I bought an ultrasonic diffuser and started using cypress oil and bergamot oil at night when I went to bed, setting the diffuser for 2 hours. (My perfect ratio is 3 drops cypress + 7 drops bergamot.) Within two days, I started feeling better. After a week, I took some time off from the mixture. After a few days, I started feeling low again, so back to my recipe. Again, within 2 days, I started feeling better. Of course, no essential oil can take away the grief I bear over the loss of my mother, but it does help me function, sleep well at night, and feel better. No need for pharmaceutical antidepressants. USE BERGAMOT OIL! Bought this oil to help with a slight cold everyone in the house seems to be getting. Smells great & works well. So happy to have this oil and be able to get it for a reasonable price so much better then the "others"
This is a very versatile essential oil. I love it diffused with peppermint and lemon. It can be used for skin and digestive issues. This is a wonderfully smelling oil! It has a great fresh, light, slight citrus smell! I love to place it on my wrists and palm of my hands for a quick pick me up during the day. I have also added this to a 2ounce spray bottle with lime and distilled water for a refresher as well. Wonderful Oil! Truthfully I love this oil, as I do all of Jade Bloom's oils. I use Basil for knee and muscle aches. Works great. Started using this with Lavendar in my diffuser at bedtime and love the scent. Also just like to put a drop or 2 on the back of my hands to smell throughout the day! Refreshing! I love the scent of the bergamot! It is my "happy" oil. It smells amazing and will lift your spirits! Love this stuff! This oil smells amazing!!! I love the uplifting scent. I have mixed this with Russian Clary Sage when making soap and the scent is amazing! This oil smells good enough to wear as a perfume ! Bergamot has become my favorite oil for smell. I use it as perfume every day and get tons of compliments ! Love this oil ! I have used other more expensive Bergamot oil and Jade's quality is excellent and much more affordable ! Thank you Jade Bloom ! Great citrus lemony smell. Good mood balancer. I use this oil to help lower fever in my grandson. Put it on the bottom of his feet with socks on. Love this oil ! Love this scent in my diffuser or on my wrists and behind my ears ! This has such a wonderful aroma!!! Wow!! I had no idea what this would be like but had read about Bergamot for quite some time...I LOVE the way it smells! LOVE the smell. I LOVE to blend it with other citrus oils in my diffuser! I love this! It smells wonderful! I am happy with it. Did not know this was a citrus oil. Goes great in uplifting blends!